How was everyone's weekend? I think I took a total of 4 showers in the past two days due to So Cal's hot, humid and sticky weather. But the nights were cooler and perfect for a BBQ. So for a veggie side dish, I grilled up some Garlic and Thyme Artichokes. Instead of just eating plain ole steamed artichokes, I slathered on some olive oil, chopped garlic, fresh lemon thyme and a few sprinkles of lemon pepper and popped them on the grill. I love grilled veggies so much more than cooking them on the stove or microwave, because the smoky charred bits give them an extra boost of flavor. Prep the artichokes by cutting an inch off the top with a serrated knife. 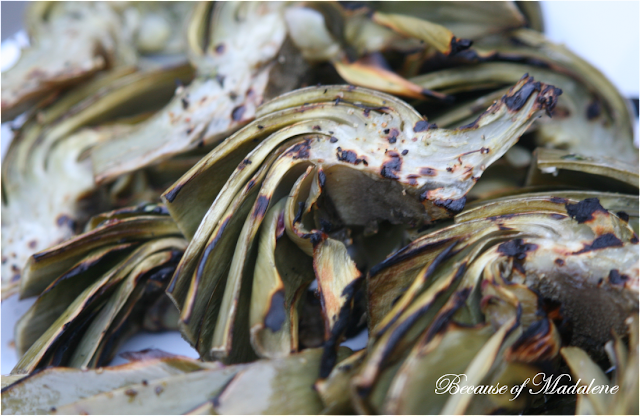 Pluck off any dark outer leaves near the base of the artichoke. With scissors trim the prickly points off of each leaf. Trim off the bottom by leaving a 1 inch stem. 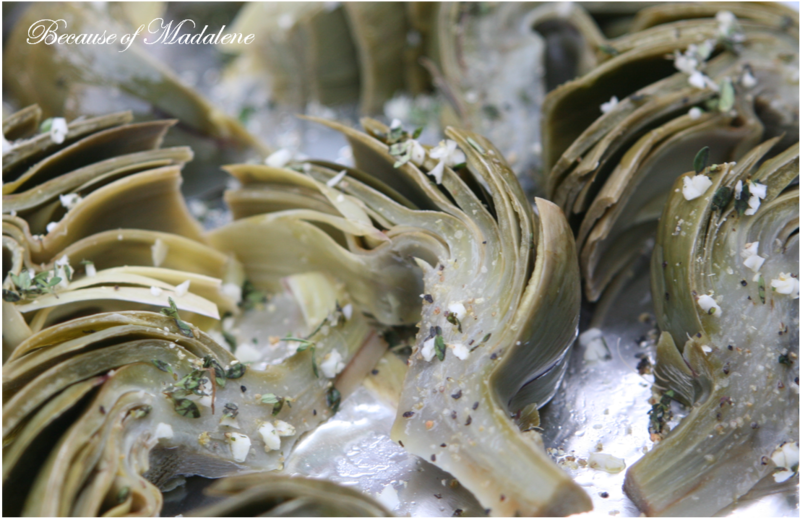 Cut the artichokes into 8 wedges (cut in half, then cut each half into four). With a paring knife, cut out the fuzzy middle and prickly purple center leaves from each wedge. Over medium high heat, boil the wedges in an pot filled with 8 cups of water and fresh lemon juice from the lemon and kosher salt. Toss in the lemon shells, too. Cover the pot and steam until the artichokes are fork tender, (about 20 mins). Remove the wedges and place them on a foil lined baking sheet. Brush with olive oil (both sides). Then sprinkle them with the chopped garlic, thyme and lemon pepper. 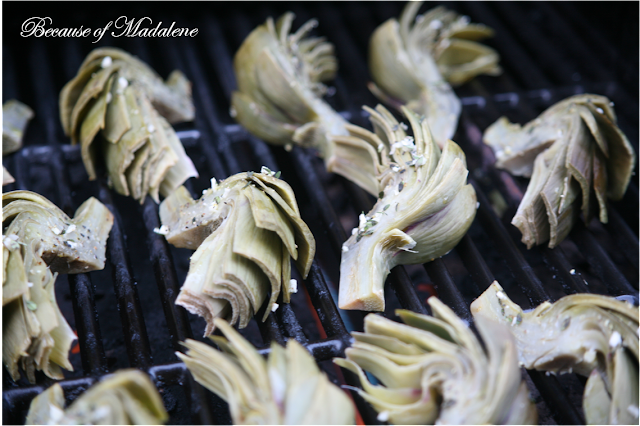 Over a low flame grill, cook the artichokes on each side for about 5 mins or until they are slightly charred. Remove from grill and eat hot or cold. Gorgeous pictures of what must have been delicious! Hmmm, not sure I'd like this...never had artichokes, but it looks interesting! No? When they are seasoned right they are completely delicious and fun to eat, too! When I only steam them, I soak the hearts in butter, salt and pepper. You must try and let me know! Well it just so happens that I too am 27 and my mother calls me an old soul as well. 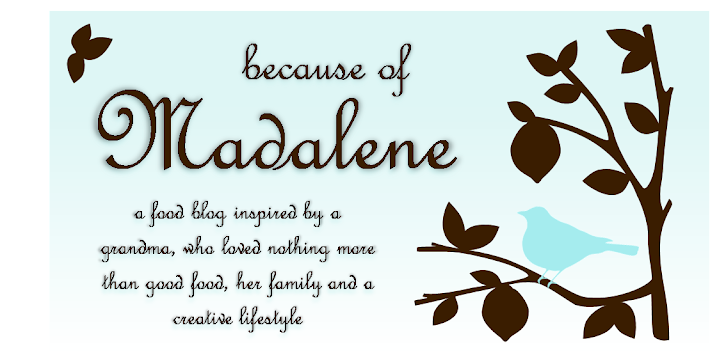 lol Love your blog!